From left: Jalen Mills, Alshon Jeffery, Chris Long, Nelson Agholor and Zach Ertz. Now that the Philadelphia Eagles have vanquished the New England Patriots and earned their first-ever Super Bowl title, it's time to bask in the national glory of a championship. That means you can probably expect quite a few television appearances from Eagles players in the weeks and months to come. 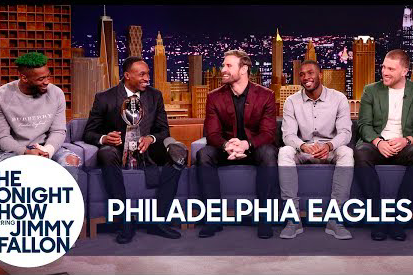 On Tuesday, five Eagles joined "The Tonight Show Starring Jimmy Fallon" to talk about the Super Bowl and show off Philadelphia's shiny new Lombardi Trophy. Zach Ertz, Nelson Agholor, Chris Long, Alshon Jeffery and Jalen Mills were all on hand to explain what the win means to them. "Who's the first person you thought of when you won?" Fallon asked Jeffery. "Where did your head go to?" "I thought of my grandmother," Jeffery said. "She passed away, so I kind of dedicated the season towards her. She passed away before the season started."